TROY, Mich., Sept. 12, 2018 (GLOBE NEWSWIRE) -- WEYV, an app platform with music, magazines, e-books and more all in one experience, today announced its new WEYV skill for Alexa, Amazon’s cloud-based voice service. Using WEYV on Alexa is simple and hands-free – once enabled, voice commands like “Alexa, ask WEYV to play Top of the 90’s playlist,” are available and Alexa will respond instantly. 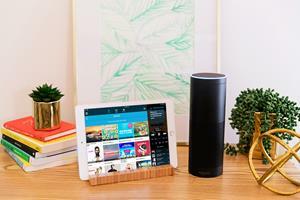 “As consumers are increasingly utilizing Amazon Alexa as part of their daily rhythm, it was important for us to build a skill for Alexa to make our users’ music accessible hands-free,” said Stephanie Scapa, CEO of WEYV. To enable the WEYV skill on Amazon Alexa, simply open the Amazon Alexa app on your mobile device, select Skills from the menu and search for “WEYV.” Then select it from the search results, tap Enable and login to WEYV. To learn more about how WEYV works on Amazon Alexa, please visit WEYV’s help page.